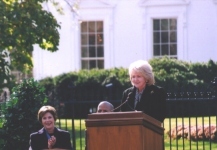 On November 9, 2004, the Federal Highway Administration (FHWA) participated in a ceremony marking completion of the Pennsylvania Avenue Streetscape and Security Improvements Project in front of the White House. The road has been closed for security reasons since the Oklahoma City bombing of the Murrah Federal Building on April 19, 1995. 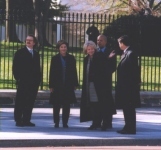 The restoration project was designed to create a pedestrian plaza on the segment of Pennsylvania Avenue between 15th and 17th Streets, NW., and improve conditions at H Street and Jackson and Madison Places. The goal was to improve the condition of the Avenue as well as enhance security. The new pedestrian plaza provides better public access and a generous open space, enhancing views of the White House and other landmarks in the Nation's Capital. The project included security enhancements, new granite pavement and sidewalks, new site furnishings such as granite benches, new streetlamp installations and landscaping. 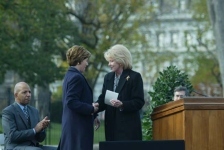 The FHWA administered the design and construction contracts for the reconstruction project in cooperation with the National Capital Planning Commission, the D.C. Department of Transportation, the General Services Administration, the Department of the Treasury, the Secretary Service, and the National Park Service.